… on a trip through London’s notorious Underground. Yes, we’re alive, and yes, we’re glad that almost all of our watchers decided to stay with us. and we think that this proof of trust is also worth a “thank you!”. Hi, I'm Chris, and I joined the Zeitgeist team three months ago. I've been programming for some years now and recently started studying "Informatics: Games Engineering" in Munich. I've taken the role of the "Lead" (aka the only) Programmer, which basically makes me responsible for making all the awesome, technical "behind the scenes" stuff work. Like most of the fine folks in the team, I bring a lot of experience with the Source Engine along, which greatly helps my doing my job as well as giving technical informations and advice. So far everything is coming along quite nicely - we got some big features up for development that will make Zeitgeist an enjoyable and immersive experience. I hope you enjoy this little demo. Although it's not exactly much, it's supposed to show you that we're still working on this game every (well, almost) day. topic of its own rather than showing all new developments mixed together. weapon before closing in on gameplay aspects and, eventually, a demo. Keep your fingers crossed. Curious about the other things we have been working on? Visit us again in the next weeks! It's great that this mod is still going. EDIT: Bear in mind, I've never made any single player maps, so this is coming from someone who has only done entity design for multiplayer levels. basically yes, this absolutely could work, but it's a tad more complicated for Zeitgeist (how else could it be ;/ ). 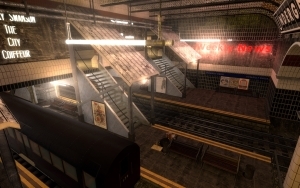 We've got three different fictional tube lines - Juvenile, Centurion Line and Edwardian Railway, and while these three lines cover most of the Stations, some can only be reached with a specific line. Thus, we had to think of a different method. Can you change the walking sounds? Maybe something that sound like they're not wearing combat boots? yes, of course. We're going to change lots of sounds, not only those of the boots, but also those of vehicles like the annoying tracktrain idle-moving and, of course, weapon sounds. image 3, too much bloom IMO. perhaps its just a bad angle to snap a photo. looking forward to more from this mod. Excellent! The environment's looking quite detailed and atmospheric and the map unfolding animation looks very nice. still, am a bit disappointed with what is shown here after such a long time, hopefully those next 3 updates that you are talking about will be revealed within weeks and not again half years waiting time. 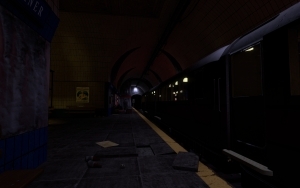 about the gameplay movie, the train sound was already there even when the train was still standing still. and when it started to drive the sound of the train was one of a train driving very fast. hopefully this will be changed in the future because now it sounds rather strange. other then that, much success with the progress and hopefully the next gameplay movie will show us more of actual gameplay. yep, sounds are going to be the next issue we'll tackle. For now, we're stuck with the HL2 sounds, but our Members Maddin and Jonko will soon take on the matter. Of course this is "just" a train ride video, but we had to start somewhere. And no, the next couple of updates will all happen within 2011 ;). don't worry, we have been quiet for quite some time, but that doesn't mean that we've spent it twiddling thumbs. we have a few things that are almost ready to be paraded round the streets. Who did the awesome anims for that trainmap? And Ive been at Picadilly station if I remember correctly. I hope we see some good poeple there! Jerp, was pretty awesome. And Nauz worked on FragOUT, and now also on Zeitgeist, but he said he didnt do the animations here. Looking awesome. Keep up the good work! Impressive work, you don't make updates often but if it's always that good... keep it up ! Cool, last week I saw this in my mod watch and I thought "what happened to that mod :(", but here you are! Yay. awesome update, love the "map" feature and the animation... looks beautiful! Für eure wirklich schöne Mod erstmal ein großes Lob. Tolles Update. Aber sind eigentlich für die ferne Zukunft weitere Passagiere geplant die mit einem zusammen den Zug betreten bzw. verlassen? Zwar würde das sicherlich einiges an Arbeit bedeuten aber bestimmt sehr lebhaft wirken. hey folks, glad to see some of you like the map i made. 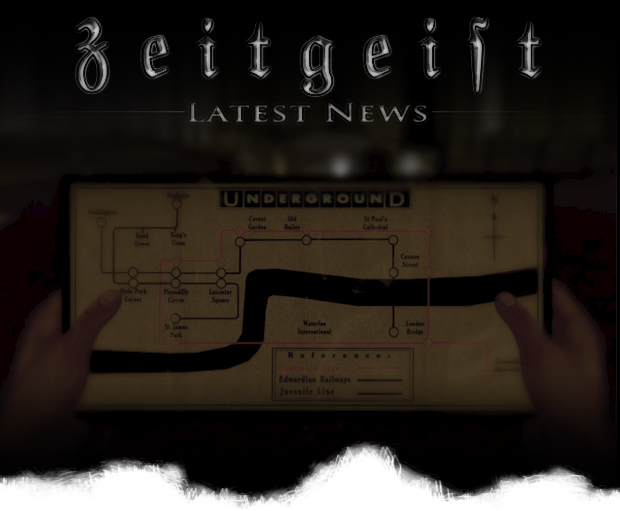 as for passengers: there will be an update with civillians raoming the maps.. i'm working on some models right now. making them use the trains shouldn't be too hard. He's the one responsible for those sweet unfolding animations :). 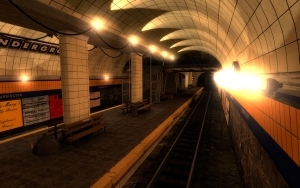 It is good to hear that you finally implemented the train system. 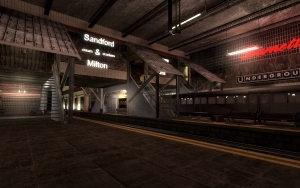 I think it was a hard task and also it may have blocked progress on other departments like Level Design because you could not know exactly what is important or necessary in the overall design of the stations. 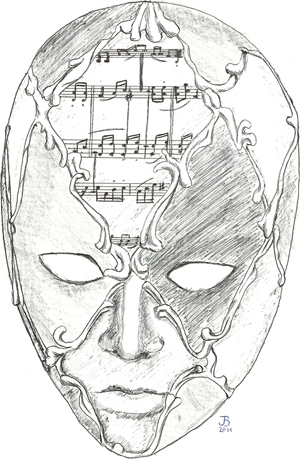 ok that head/music sheet drawing = genius. Still excited for this to come out! To see that beautiful work push up my mood. and i am really impressed about your creative spirit. Klasse, weiter so, Gute Arbeit!